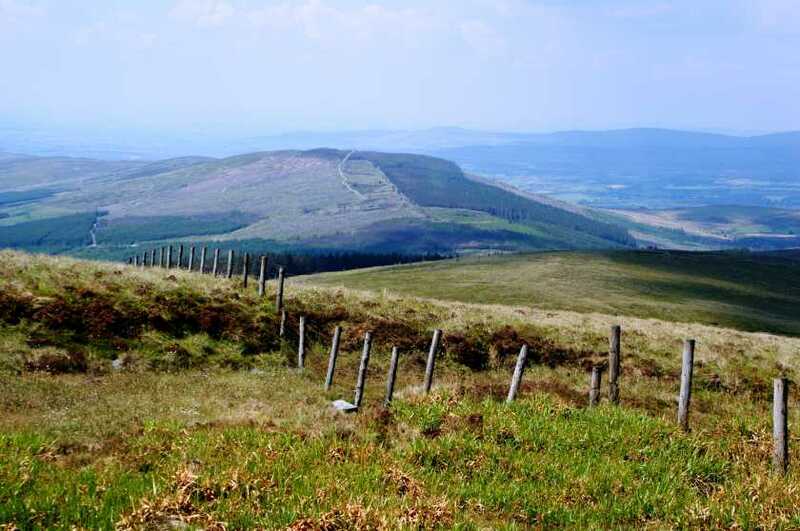 Curraghchosaly Mountain is one of the more westerly of the Sperrins, and faultily apes the higher Mullaghcarn across the B48 with its 50/50 mix of bare slopes and dense forestation. Forest roads hereabouts are being promoted quite heavily as mountain biking venues, and these same thoroughfares provide easy access to the summit, the climb being shortish and very much on the 'steady' side of 'steep'. 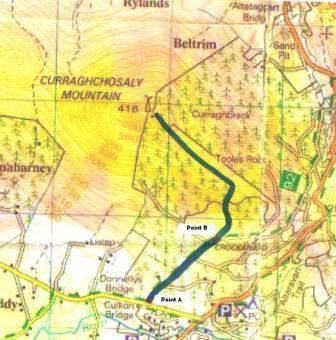 Getting from this starting point to the tracks that take you to the summit of Curraghchosaly may not be entirely straightforward. 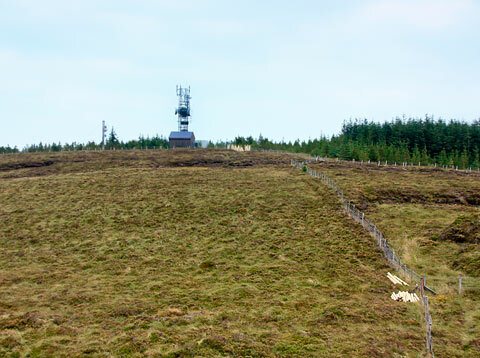 The Ulster Way could be used however you would need to descend 60 or 70m and go over 1km to do it. 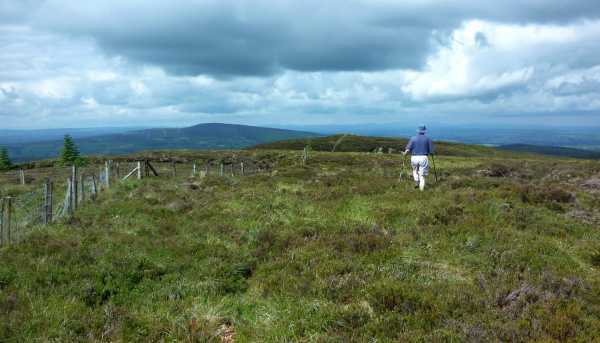 There is also the Altaravan Trail marked as going north along the road and then heading up a slope to reach the forest tracks to the SE of the summit. We could find no sign of the Altaravan Trail however by following roughly its route we got onto the tracks. Go around 200m or so along the road and then strike up the steep bank NW. Head roughly N and you will reach one of the tracks. 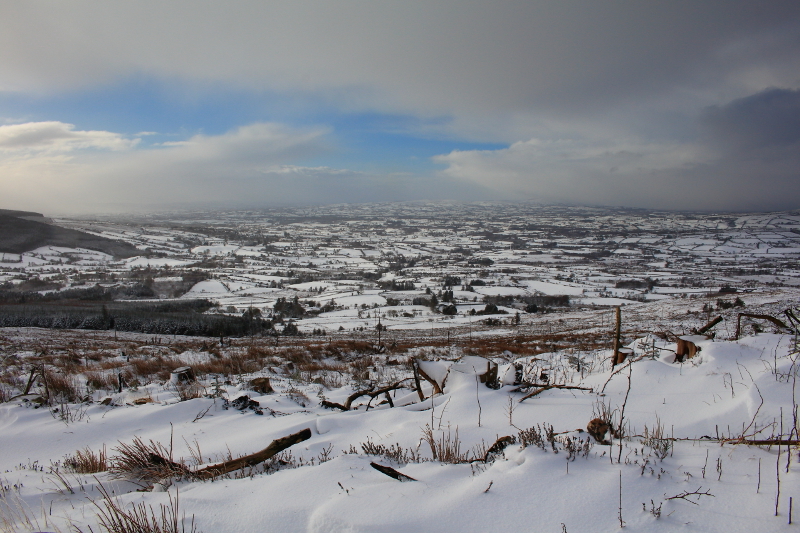 The ground as of 2008 is rough "clear felled". Head SW along the forest track (it's marked on the 1:50k map). After 700m turn right and go around 320m NE. There is relatively open land there and you can head up and NW. A forest track will appear from the left going in roughly the same direction. Take this and head up.